The award was established by the will of Alfred Nobel, Swedish chemist and inventor. The prize awarding ceremony is annually being held on December 10 of every year to the anniversary of Alfred Nobel's death. It is being awarded for outstanding contributions in Physics, Chemistry, Literature, Physiology or Medicine and Peace since 1901.
" for groundbreaking achievements concerning the transmission of light in fibers for optical communication"
born in Shanghai, China 1933.
born in Amherst, NS, Canada 1924.
born in Chidambaram, Tamil Nadu, India 1952. "for the discovery of how chromosomes are protected by telomeres and the enzyme telomerase"
born in Hobart, Tasmania, Australia 1948.
born in London, United Kingdom 1952.
born in Nitzkydorf, Banat, Romania 1953. 44th President of the United States of America. 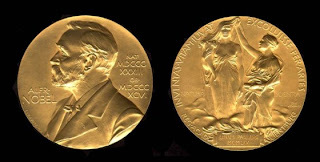 Nobel Memorial Prize in Economic Sciences (officially The Sveriges Riksbank Prize in Economic Sciences in Memory of Alfred Nobel), reffered to as the Nobel Prize in Economics, was established and endowed by Sveriges Riksbank, Sweden's central bank, in memory of Alfred Nobel. No Comment to " Nobel Prize "